If you need more free space on your paddleboard, if you want to do things more conveniently on your board, Goplus inflatable board can be the right pick for you. This 11-feet length and 30 inches wide board will provide you with more breathing space. Thus, your every riding will be more adventurous and enjoyable. Read standup paddleboard review here. I am going to write Goplus Inflatable 11′ Cruiser Review now. 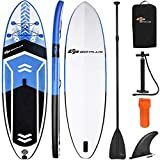 Goplus inflatable paddle board is the right purchase for those who want more from their paddle boards. Dig down to the Goplus Inflatable 11′ review to know why. Goplus paddleboard is made of the best military-grade drop stitch materials. These military grade materials are the best available materials that are used for the construction of paddle boards. So you don’t need to be worried about the solidity and shock absorption power of your paddle board. Also, your board will not experience any dings and cracks easily. Rigidity or the rigidness of a paddleboard is measured on the basis of building components and the thickness. The GoPlus board is strong in both sections of the measurement. It has been constructed with military drop stitch materials and has 6-inches stiff thickness. 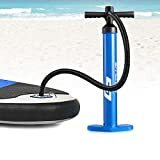 Furthermore, this kind of rigidity works best for the newbie riders; it reduces the wobble and helps the learners in keeping balance on the sup. A large portion of the board surface is equipped with an extra soft EVA textured foam deck pad. The pad ensures proper grip and comfort for the riders even in an unusual condition, mostly when the board is soaked with the splash. Your child and pup will be secured and snug on this pad; you will also get extra relaxation while doing yoga on the board. Fins improve the tracking at the time of riding. This board is featured with one fin navigation system, that one is placed in the center of bottom nose panel. The fin is removable; you can remove or install it without using any tool. Goplus cruiser featured with 5 D-rings. Among 5 rings, 4 rings are mounted under the bungee cord area; additional one is located in the tail end near the air valve. The bungee area is covered with rubber ribbons; you can use the bungee cord area to secure your food, clothes, extra gears, backpacks, etc. The additional ring is used to tie up the ankle with the board, this tying ensures your regular attachment with the board whether if you lose balance and fall in the water. A carrying handle is mounted in the middle of the board. Using this handle you can transport effortlessly along the shore. You should use the handle to carry the board only in the inflated condition. The air valve is used to inflate and deflate the sup. 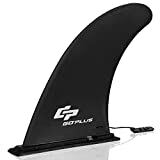 Goplus sup board comes with a high-quality air valve; it is placed on the tail end of the board. Goplus paddleboard is a good performer in any water environments; you can take this sup through oceans, lakes or rivers. Moreover, the rigidity makes this board stable, so any skill level riders are able to achieve more balance and stability during riding. Also, the removable center fin provides the board extra stability, that’s why it performs well in the surf and flat water. The extended deck pad allows you to do water surfing, yoga, and fishing conveniently from the sup board. High-end building materials and stiff thickness made this board durable enough. The exterior design of the board is tough enough to stand against the drop on the rock, hitting with the lake edge, and any kind of torture. So, you have nothing to worry about the strength of the board. see how to use paddle boards. Made of durable military grade materials. Goplus 11 has solid rigidity. Good performer in any water situations. The pump is not good enough. Inflation of sup board has just 3 simple steps. At first, connect the pump with the air valve. Secondly, keep pumping. Finally, remove the pump when the board is fully inflated. Deflation is super easy, to deflate Goplus sup board, just push and turn the valve lock, and wait for the full deflation. You can also check the user manual for further details. Goplus sup inflatable board is best for the riders who need more free space on their board, who want to ride along with their partners, who seek more freedom in fishing, sleeping, doing fitness works on the board. 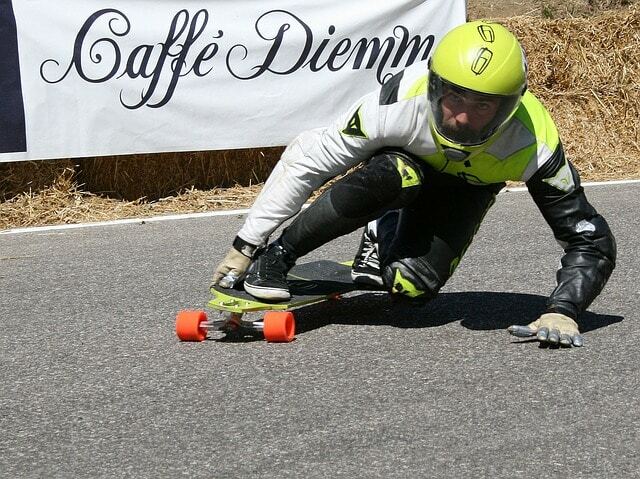 Question-1: Is the board comfortable to use while kneeling? Answer: Yes, the board is. Even you can adjust your paddle length with your height while kneeling. 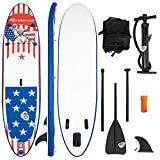 Question-2: Is this board good enough for cruising in the choppy Ocean? Answer: It depends on the nature of the ocean’s wave, as it is a paddleboard, a clam Ocean is preferable. 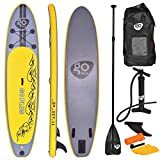 Goplus inflatable board comes with some essential gears such as a paddle, an air pump, a backpack, an ankle leash, and a repair kit. An aluminum paddle is provided with the board. The paddle is adjustable to 63” to 83”. So, you can adjust the length of the paddle according to your height. It also floats on the water for 4-5 minutes. You will get a manual hand pump with PSI gauge to inflate your board. The manual pump is not top notch for this kind of board; it may take a few extra minutes to fully inflate the board. A high-quality comfortable backpack is provided with the Goplus paddle board. You can carry your sup board and belongings inside the bag and travel wherever you want. The bag stores the things arranged as well. Here also, you will get a neoprene ankle soft cuff along with the board; the ankle leash fits with any ankle size. 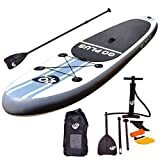 Some people love to ride by themselves, some love to ride with their youngsters, pets or with partners, if you are among the latter, you can go with this Goplus 11 inflatable paddle board. With 11’ length, 30” width’ 6” thickness, and 330 lbs weight aptitude; you can do more than just floating on the water. 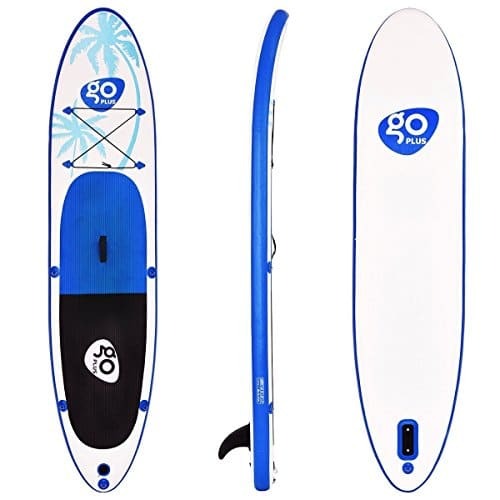 Super Durable Double Layer PVC -- Goplus paddle board adopts double layer PVC and drop-stitch construction, which allow the surfboard withstand a lot of pressure without deforming or bursting. The EVA has good friction, which will prevent user from sliding. It's sturdy and safe for long time use. Easy to Carry and Store -- It comes with a carry backpack, when the board deflated and rolled up, it's only 26lbs, you can easily store and transport it to wherever you want to go. And when you inflate the paddle board, there is a carrying handle on the board, which is really convenient for use. 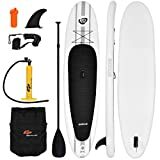 Full Equipments -- Besides the carry bag for easy carry, Goplus iSUP package also includes the extendable paddle, fin, manual pump and repair kit. With these equipments, you can quickly and easily inflate and play it. And you can also fix it quickly with the repair kit..
Controllable Details -- 1, This paddle is extendable, you can adjust the length from 67" to 83" as you want. 2, There are three tail fins on the back of the paddle, two of them are fixed and one is removable. These fins can increase the friction and balance, very safe when use. 3, The 440lbs large weight capacity allows heavier riders to enjoy this fun paddling sport. Multifunctional Use -- The large space of Goplus inflatable paddle board allows more people to play on the water together. It is also perfect for all skill levels and suits in most water environments. You can take a cruise through oceans, lakes or rivers. And it also can be used for surfing, water yoga, fishing and other interesting activities with water. 【Super Durable Double Layer PVC】The paddle board adopts double layer PVC and drop-stitch construction, which allow the surfboard withstand a lot of pressure without deforming or bursting. And the EVA has good friction, which will prevent you from sliding. It's sturdy and safe for long time use. 【Full Equipments】Besides the carry bag for easy carry, it also includes the extendable paddle, fin, manual pump and repair kit. With these equipments, you can quickly and easily inflate and play it. And you can also fix it quickly by yourself. 【Controllable Details】This paddle is extendable, so you can adjust the length from 67" to 83" as you want. And there are three tail fins on the back of the paddle, two of them are fixed and one is removable. These fins can increase the friction and balance, really safe when use. Extra Durable -- It is made of high quality PVC and constructed with drop-stitch construction, which provides stability and safety for long time use. And it equipped with high quality bungee on the front deck, you can grab it to keep safe. 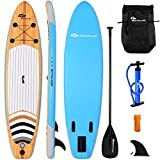 Portable Paddle Board -- Comes with a carry backpack, you can easily store and transport this board to wherever you want to go. When deflated and rolled up, this paddle board is only 26 lbs. Really convenient for daily use. Multifunctional Use -- This paddle board is perfect for all skill levels and suits in most water environments. You can take a cruise through oceans, lakes or rivers. The deck pad has been extended all the way to the tail of the board for those interested in water surf, yoga, fishing. Exquisite Details -- It features durable top foam, non-slip grip and 4 point mounted bungee system, which provides extra safety when riders play with it. The large weight capacity allows heavier riders to enjoy this fun paddling sport. Total Kit Included -- Total kit includes a front bungee for storage, carrying handles, backpack for transportation, hand pump with PSI gauge, repair kit, fin, leash for safety and deluxe lightweight paddle. High Quality and Sturdy -- The paddle board adopts the high quality EVA and drop-stitch construction, which allow the surfboard withstand a lot of pressure without deforming or bursting. And the EVA has good friction, which will prevent you from sliding. It's sturdy and safe for long time use. Multifunctional Use -- Its large space allows more people to play on the water together. It is also perfect for all skill levels and suits in most water environments. You can take a cruise through oceans, lakes or rivers. And it also can be used for surfing, water yoga, fishing and other interesting activities with water. Easy to Carry and Store -- It comes with a carry backpack, when the board deflated and rolled up, you can easily store and transport it to wherever you want to go. And when you inflate the paddle board, there is a carrying handle on the board, which is really convenient for use. Full Equipments -- Besides the carry bag for easy carry, it also includes the extendable paddle, fin, manual pump and repair kit. With these equipments, you can quickly and easily inflate and play it. And you can also fix it quickly by yourself. Controllable Details -- This paddle is extendable, so you can adjust the length from 67" to 83" as you want. And there are three tail fins on the back of the paddle, two of them are fixed and one is removable. These fins can increase the friction and balance, really safe when use. 【Durable Material】It is made of high quality PVC and drop stitch material, which provides stability and safety for use. It also can be used for a long time. Besides, the weight capacity of the paddle board is up to 280lbs. It will meet most people's needs to play. 【Different Use】This paddle board is ideal for all skill levels, with its length and proportion. It can provide excellent glide for fishing ,cruising, exploring and fitness. If you love the open water, there's nothing quite like enjoying it as you're standing at the paddle board. 【Wide Top Deck and Adjustable Paddle】It features a wide and non-slip soft top deck, which provides improved stability and balance for kids and adults. The aluminum paddle can be adjusted from 35'' to 87'' for different ages of people to use. 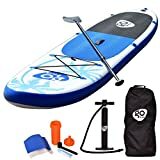 【Easy to Inflate and Carry】This paddle board inflates and deflates quickly for easy use, storage and transport. Wherever you want to use it, you can easily put it in the corner of the car. Transport and then just inflate it. Really inconvenient for your daily use. 【Complete Accessories】Comes with a big removable fin, a nose mounted carry handle, 4 points mounted bungee, and 5 D-Rings. It will be easily for you to inflate and use. Two Ways Pumping---When the white switching valve is in a flat position, use double action to inflate your board each time you pull up and push down. When the switching valve is in a concave position, use single action to inflate your board each time you push down. Equipped with Pressure Gauge---Air pressure gauge included to show the pressure reached inside the sup board or boat, for accurate control of the air pressure and it reads up to 29 PSI. Built-in Foot Plate---Solid construction with large built-in foot plate for additional stability while in use and easier for you to pump. Perfect for inflatable stand up paddleboards, SUP, boat and kayak etc. Easy Connection---Equipped with a 49 inch long inflatable hose, easy to use thread on hose to pump connection. A convenient tool to inflate and deflate your SUP, use the OUT port for Inflation and IN port for Deflation. Easy to Carry and Store---Compact and lightweight design is easy to carry and store. You can put it in any corner. And if there is any problem with the hand pump, please contact us and we will reply to you within 24 hours. 【High Quality and Sturdy】The paddle board adopts the high quality EVA and drop-stitch construction, which allow the surfboard withstand a lot of pressure without deforming or bursting. And the EVA has good friction, which will prevent you from sliding. It's sturdy and safe for long time use. Classic Fin: This universal fin is designed for center fins for surfboard and paddle boards. Its classic design provides good hold in both flat water paddling and turning around. Reinforced Nylon: Molded with fiberglass-reinforced nylon composite materials to make sure the fin is strong and durable. It offers perfect balance of pivot and hold, which adds extra safety for you. Suitable for Different Models: This detachable center fin fits almost all SUPs and longboards with 'Universal' or 'US Style' fin boxes. Makes convenient for you to replace the original fin quickly. Easy to Assemble: Don't need any professional tool, you could quickly assemble or remove the fin to your surfboard. Enjoy surfing just now. Customer Service: We offer you 100% risk-free satisfaction guarantee to let you buy with confidence. We are quite sure that you will be super-impressed with the durability, high quality of our detachable fin. Contact with us freely if you have any problem.